The visiting Cobourg Cougars tried to make a one goal lead stand up during the final game of their 2018 Ontario Junior Hockey League preseason slate. And, for the better part of two periods, Wes Dobbin’s goal just over four minutes into the game that surprised Wellington starter Olivier LaFreniere was the winning margin. The Dukes would be stymied by the system employed by Jerome Du Pont time and again and, should Wellington player get the times and space to put a critical volley on the Cougar net, a combination of Dershann Stewart and Jacob Hearne was there to thwart the home side time and again. But credit this Wellington squad for keeping the game close and waiting for their opportunities that surely would come as some point. That point was a little over midway through the third period and came on a Wellington man advantage. With Cougars veteran Matthew Bumstead off for a stick infraction, Dalton Bancroft was able to fire home an equalizer after Andrew Rinaldi and Elijah Gonsalves worked to deliver the puck to a prime shooting location at the 11:54 mark of the third. Now buzzing, the Dukes were able to catch the Cougars flat footed and it was Matt Poole picking up a loose puck and beating Hearne on a unassisted effort at 13:39. Wellington would salt it away in the late going as blueliner Ben Roger iced the contest with under a minute to go to make it a 3-1 Wellington final. 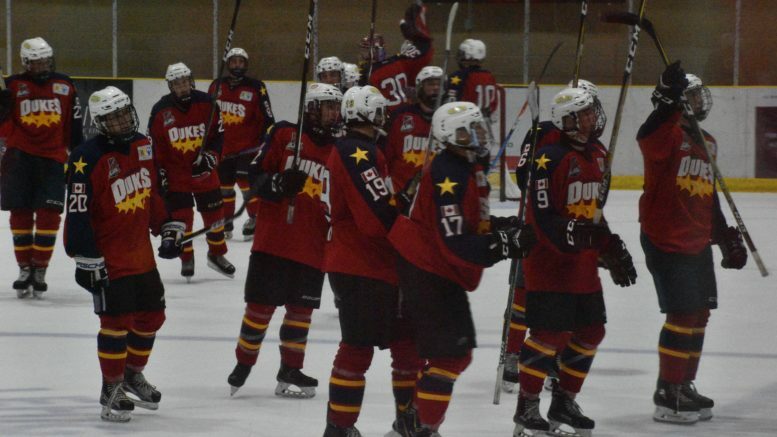 The win means the Dukes finish the preseason with a spotless 4-0-0 record ahead of Friday’s home opener at Lehigh Arena where the defending Buckland Cup champions start their title defence with a game against the same Cougars. LaFreniere made 31 stops while Stewart was 23 for 23 in the first half of the contest. Hearne faced 20 shots and stopped 17.